Yet another retread has written me and asked for help in understanding why he is having trouble negotiating curves. Indeed, in this case, why he was UNABLE to make his bike turn properly and ended up crashed at the side of the road. Bought a bike in Mar. 08. First time on a bike in over 20 yrs. Have never had trouble before. Crux of my inquiry as follows. Was on country road recently on a tight curve to left. Speed was good, lean angle was good. Bike momentum kept pulling me to right and ended up in ditch, when I was trying to steer left through turn. Make sense? Can not figure out what I did wrong. Wonder if I was target fixated or if I was under-steering. Am reading with interest your articles on counter-steering, and related articles on curves. Will be taking safety course at first opportunity, but in mean time,am still re-learning and practicing. Sound familiar? His bike was 'fighting him' on that turn. Thanks for reaching out and for your kind comments. I will, of course, try to help you with this issue. First, I would like you to clear your mind of EVERYTHING you may have read or believe relative to counter-steering. I will attempt to replace that bulk of knowledge with a disciplined and rational real world set of information that you can absolutely believe without any confusion (or time lags) - thus USE as needed. I'm sure that in your reading you have learned about gyroscopic effects and camber thrust and associate those with counter-steering. Forget about them! They do NOT cause counter-steering to work. Instead, they make counter-steering smooth and effortless. You need to understand what counter-steering actually is and how to control it, and that's all. At speeds below about 10 mph you can ONLY direct-steer. That means that you can ONLY turn your handlebar in the direction you want to go, cause the bike to lean, and then use BALANCE and speed to complete that turn. Notice the word BALANCE is in caps - that, because ONLY when you are moving at speeds less than about 10 mph are you required to assist your bike in maintaining its attitude and not fall over. At higher speeds (by that I mean more than 10 mph) there is NO BALANCE WHATEVER required by you in order to help the motorcycle stay upright - NONE! The reason for that is that virtually everything about a motorcycle involving its attitude reverses at about 10 mph. For example, if you are turning while moving at, say, 5 mph, and your bike begins to fall, you can save it by merely increasing its speed. But if you are turning while moving at, say, 20 mph, and your bike feels like it is leaning too far (and, thus, in your mind might fall onto its side), if you increase your speed the lean angle will get LARGER (the lean angle will increase). That's right, it leans more when you INCREASE speed and it 'falls' UP instead of down when you reduce your speed while in a turn. The fact is that at any speed over about 10 mph the bike, BY ITSELF - without input from you - determines what the right lean angle should be. YOU CANNOT establish the lean angle. Note that I am now talking about the angle of lean of the combined bike and you. You can, of course, cause the bike itself to lean a little more or less by shifting your body lean angle in the opposite direction, but doing so IN NO WAY changes the lean angle of the combined bike and rider. That is just another way of saying that balance is not only unnecessary, it is also USELESS at speeds over about 10 mph. When you make a turn it is your perception that you are leaning the top of your body along with the top of the bike INTO that turn. But that is NOT what actually happens. Imagine holding an inverted broom on the palm of your hand, bristles at the top. Balancing that broom is no big deal. If the top of the broom starts to move to the right, you move your hand to the right and that saves it. But now imagine that you want the top of the broom to move to the right. Clearly the way you make that happen is to move your hand to the left. The top of the broom then SEEMS to be moving to the right but what is actually happening is that your hand is moving to the left and the top of the broom is essentially staying in place. That's because of INERTIA. Mass tries to stay in whatever attitude it is in. EXACTLY the same thing happens when you are moving at speeds greater than about 10 mph and you want to turn your bike to the right. You do that by moving the contact patches of your wheels to the left. Inertia tries to keep the top of the bike and your head in place while the wheels OUT-TRACK to the left. The result is that it appears that you have leaned the bike to the right. What happens after that starts the lean to the right is that your front wheel is AUTOMATICALLY forced to turn slightly to the right. That is NOT the result of your turning the handlebar to the right but, rather, it is because you LET the handlebar turn to the right. And, as a result, the bike begins traveling in a new direction - to the right of where it was pointed when you began the direction change. I just described how counter-steering actually works and how you start it. Note that counter-steering is not a momentary thing that you use to begin a change of direction - it is the only way you can change direction (like making it go even more sharply to the right) at speeds over about 10 mph. That comment about letting the handlebar turn to the right is EXTREMELY important for your understanding of counter-steering. You see, you MUST MAINTAIN some counter-steering pressure on your handlebar in order to continue turning to the right for as long as you want to keep turning to the right! It is simple to visualize the concept of out-tracking when you start a turn. For example, if you are moving straight ahead and you turn your front wheel slightly to the LEFT of dead ahead, you now know that will cause the bike to APPEAR to lean to the right, but the reality is that the front wheel contact patch (like your palm when balancing that broom) moves to the left. What is not so obvious is that when the front wheel of the bike then begins to turn to the right IT CONTINUES TO OUT-TRACK. That is, it continues to point slightly to the LEFT of your INSTANTANEOUS direction of travel. Now you need to know about one more less obvious force at play here: the RIGHTING FORCE. You know, I'm sure, that your motorcycle tries all by itself to ride in a straight line, vertical. If you removed your hands from the grips and simply sat on your saddle, the bike would try to go in a straight line. That, because of TRAIL. Trail causes the front tire to try to turn in the direction of instantaneous travel. 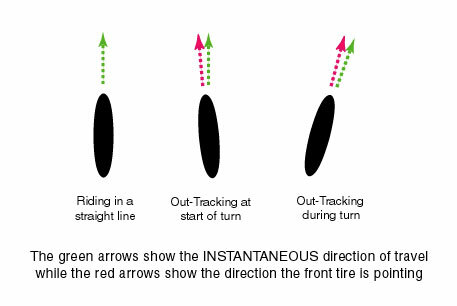 In other words, it tries to make the front wheel point in the direction of the green arrows. In the above diagram trail would try to make the front wheel turn to the right. And if it is successful in turning the wheel so that it points in the direction of the green arrow, the bike would THEN BE MOVING STRAIGHT AHEAD. So, the righting force is what is pushing against your inside grip hand and it is what you must push against in order to continue turning. Now I think you understand that counter-steering is not just how you start a turn, it is how you continue that turn. The righting force is STRONGER than your steering input!!!!!! If, for example, you pressed forward on the right grip to cause the front wheel to out-track to the left, the righting force would push back against your input and IF YOU ALLOW IT TO (as you must), the front wheel turns back from out-tracking to the left and now points slightly to the right of where it was pointing when you started the turn, though it is still out-tracking to the left of the instantaneous direction of travel. If you had simply locked your elbows and stiff armed your right grip, the bike would immediately fall over to the right as the righting force is, as I said, STRIONGER than your input. You push hard, it pushes back harder. You complete the turn and control your bike by MANAGING THE AMOUNT OF PRESSURE YOU APPLY TO THE INSIDE GRIP. So now lets PROVE it to you and make this understanding part of your reality. Take the bike out onto a large parking lot and begin riding a LARGE oval or rectangle with LARGE curved corners. This is not an exercise in which you are trying to make a tight turn!!! All I want you to do is, while riding that circuit, lift your fingers off the grips and steer using only the palms of your hands. While moving in a straight line portion of that circuit I want you to press forward on the RIGHT GRIP of your handlebar with the palm of your right hand ONLY. You can take your left hand entirely off the grip if you want to, but in any event you are not to press forward with your left hand. You are trying to turn to the right by doing this. I assure you that the front wheel will momentarily OUT-TRACK to the left and immediately turn to the RIGHT and your motorcycle will actually turn to the right. Your job was merely to manage how hard you pressed FORWARD (NOT DOWN) on the right grip and observe that the harder you push, the sharper the turn will get. Press forward with the palm of the left hand and that will reverse the turn - getting it to go straight again - or, if you wish, continue pressing on the left grip and the bike will begin moving to the left. NO BODY LEAN INVOLVED AT ALL. No body english at all. Just out-tracking the front tire results in the turn. THAT IS COUNTER_STEERING. Your accident was the result of your not believing or understanding counter-steering. You tried to turn to the left but the bike FOUGHT YOU and was not as responsive as you needed it to be. The harder you tried, the harder it fought. In other words, you tried to direct-steer or use body English or leaning when all you had to do was press FORWARD HARDER on the LEFT grip and the bike would have INSTANTLY and without any fight at all, complied. Now please note another FUNDAMENTAL problem evidenced by this retread - he BELIEVES that the MSF BRC is a 'Safety Course' instead of a motorcycle control fundamentals class. He BELIEVES that he already knows how to control his bike (the current problem notwithstanding) and merely needs to 're-learn' what he knew. My bet is that 20 years ago he never even heard of counter-steering, let alone 'knew how to use it'.